Rangers are to boycott the initial meeting of the Scottish Premier League commission to investigate the club's alleged use of dual contracts. Employee Benefit Trust player payments from 2000-2011 are being probed. But Charles Green, the club's chief executive, says the SPL and its commission have no legal power over the Ibrox club. "The club ceased to be subject to the SPL's rules when it was ejected from its league," he said. The SPL has more than a dozen sanctions, including stripping Rangers of league titles, at its disposal should it be decided that the club broke rules about side payments. It announced last week that its independent three-man commission led by Lord Nimmo Smith would hold its first meetings with Rangers' lawyers on Tuesday and Wednesday to decide on a timescale and other procedural matters for the hearing. However, Rangers now play in Division Three of the Scottish Football League after the old parent company headed for liquidation and the new company was denied entry to the SPL. And Green said: "The Rangers Football Club Limited will not attend tomorrow's hearing of the SPL-appointed commission investigating the circumstances surrounding the use of Employee Benefit Trusts by previous owners of the club. "The club cannot continue to participate in an SPL process that we believe is fundamentally misconceived. "Neither the SPL, nor its commission, has any legal power or authority over the club because it is not in the SPL. "For that reason, it has no legal basis on which to appoint its commission. "Our lawyers have made that point repeatedly to the SPL in correspondence and yet our requests for an explanation from the SPL have been completely ignored. "The SPL's silence on these issues is deafening. The outcome of the SPL's process will have no legal effect." Green warned against the SPL taking sanctions against Rangers in their absence from the process. "To make it crystal clear, the new owners purchased all the business and assets of Rangers, including titles and trophies," he said. "Any attempt to undermine or diminish the value of those assets will be met with the stiffest resistance, including legal recourse." Green claimed that the SPL was previously willing to do a deal over the EBT claims to keep Rangers in the SPL, or playing in Division One, until the Scottish Football League clubs voted to place the club in Division Three. Rangers' EBT payments are also the subject of a tax tribunal, which is yet to be decided. Green questioned why the SPL was so keen to launch its own investigation before HMRC had released its own judgement. 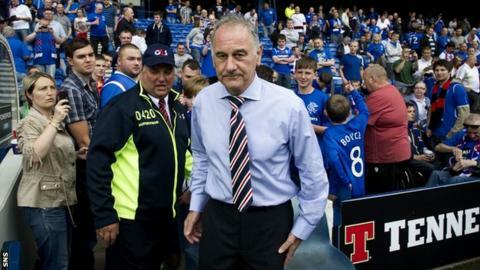 "There are powerful representatives from clubs within the SPL - not all of them by any means - who appear hell bent on inflicting as much damage on Rangers as possible," he said. Rangers' administrator, Duff and Phelps, has backed up Green's claim that the commission had no power over RFC 2012 PLC, formerly The Rangers Football Club plc. "Having taken legal advice, it is the joint administrators' opinion that the SPL is not able to pursue RFC 2012 PLC in this matter," said Paul Clark. "This has been communicated to the SPL and, considering that further involvement in this matter is not in the interests of its creditors, RFC 2012 PLC will have no further involvement with the commission."